Yesterday I got the 1,000 marketing call from some anonymous phone caller trying to sell me yet something else I had no interest in. I am sure you can relate! I know most of these random calls are either targeted to a demographic (age, zip code, credit score, political belief, etc.) and are based on throwing a wide net and maybe, just maybe, catch a few. But the ineffectiveness of this and anger I felt prompted me to remind sales people to stop this, too! And I know you’re out there..I was one myself before I realized how much time, energy and lost sales I had when I was product focused instead of client focused. It’s the way we have been taught! And the continuation of product companies bringing out a ton of product feeds our habit. Now what do I mean by that? It’s walking into an appointment with little to no strategy of HOW you will get closer to a sale. And because you THINK , they are busy (and they may even have a lot of business) busy means business, right? So you start with a little small talk. I was really good at that and it was a huge part of what I thought was my strategy. (People really liked seeing me. I would be their comedy relief from the mundane tasks of the day) If they like me, they’ll be more apt to buy, right? I would ask a few unimportant questions like, “are you busy?” If they were, I would clap my hands in glee (and in my mind really thought that was a great thing because I could sell them more) and then JUMP into showing products. That’s the pusher! Guilty! I was a pusher! We may have thought we were selling but unfortunately we were not, if I may be so bold. I believe so much of our success was based on the momentum of the company, the over-riding sense of need and just piling them with sampling and leave with such a sense of accomplishment. However, this thinking was all built on a house of cards, does not work and never did really work. And yet, what I observe in my training, is sales people are still using those same, old and ineffective techniques that product companies are still reeling from. So what is one of the answers? Easy! ASK, ASK, ASK and when you think you are finished ASK again! Dig deep! Find out exactly what they are working on. Explain that the reason you are asking is for their benefit so you don’t waste THEIR time and you will get them exactly what they need, RIGHT NOW! That’s the puller! Uncover those needs that are relevant TODAY, not in the future, and put your product in front of them that will be the solution to all those questions you asked. After all, does a doctor just prescribe a drug without asking and analyzing the answers? If they did, he would also be considered a drug pusher. The results from this one tip is you will become much more valuable to that client and, of course, close more sales. Solutions close, products alone do not. 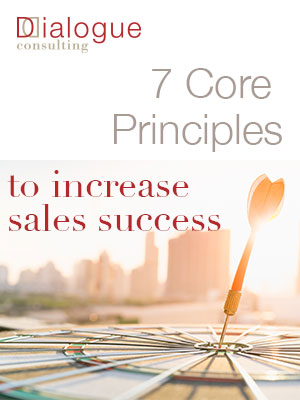 What’s missing in your sales routine when selling interior products?